The IRS recently proposed a commonsense improvement to the federal charitable deduction. If finalized, the regulation would prevent not just the newest workarounds to the $10,000 deduction for state and local taxes (SALT), but also a longer-running tax shelter abused by wealthy donors to private K-12 school voucher programs. ITEP has submitted the following official comments outlining four key recommendations related to the proposed regulation. The Institute on Taxation and Economic Policy (ITEP) respectfully submits the following comments and recommendations on the Treasury Department and Internal Revenue Service’s proposed amendments to section 170 of the Internal Revenue Code, titled “Contributions in Exchange for State or Local Tax Credits.” ITEP finds the proposed regulation to be even-handed and commends both Treasury and the IRS for their work on this important issue. Reject calls to limit the scope of the regulation only to donations to public entities or to credits established after a certain date. Clarify that donations of appreciated stock or other property benefiting from significant state or local tax credits will require recognition of gain. Address the tax shelter made possible by pairing state or local charitable donation credits with section 162 business expense deductions. Apply third party quid pro quo regulations to all donations, not just those involving state or local tax credits. The reasoning behind these recommendations is provided below. The proposed regulation improves on the tax deduction available to individuals and businesses who make charitable gifts by requiring those taxpayers to subtract the value of significant state or local tax credits they receive because of their gifts. In other words, taxpayers who see a significant portion (more than 15 percent) of their donation reimbursed by their state or local government via a tax credit must acknowledge that reimbursement when determining the size of the charitable deduction they can claim for federal tax purposes. This regulatory project was undertaken largely in response to very large charitable donation credits enacted by New York and a handful of other states in 2018. But its reach extends to similar preexisting charitable donation credits in many more states. One of the most significant categories of charitable donation tax credits in existence prior to 2018 are those available for donating to support private K-12 school vouchers, or scholarships. Eighteen states currently offer this type of tax credit. These credits range from 50 to 100 percent of the amount donated, with most of those credits totaling at least 90 percent of the donation. ITEP has uncovered significant evidence that these credits have been claimed, both before and after the enactment of the Tax Cuts and Jobs Act (TCJA), as part of a tax avoidance technique under which taxpayers seeking to avoid limitations on the deduction for state and local taxes (SALT) can bolster their charitable deductions and receive combined state and federal tax cuts larger than the amounts they donate to support private school vouchers. In fact, two-thirds of existing private school credits (12 out of 18) can be exploited in this manner. Those tax shelter opportunities are summarized in the table on the next page. States also offer a variety of charitable donation credits designed to steer money to other causes, such as social services or conservation. The size of these credits varies but they tend to be offered at lower percentages than the private school voucher credits. While lower-percentage credits must also be included within the scope of this regulation for the sake of consistency, they are less prone to being exploited as SALT cap avoidance tools and are therefore given less attention in these comments than the private school voucher tax credits. A common refrain among supporters and beneficiaries of charitable donation tax credits that existed prior to the TCJA is that their favored programs were not established as SALT deduction cap workarounds and should therefore be exempted from the regulation being contemplated now. The two most prominent options proposed to achieve this result are to exempt programs providing a tax credit for donations to nongovernmental entities, or to exempt programs enacted before a certain date. Either of these options would lead to grave inequities in the federal tax code’s treatment of taxpayers residing in different states, and would substantially erode this regulation’s ability to prevent circumvention of the $10,000 SALT deduction cap. Limiting the scope of the regulation only to donations to non-public entities would result in inequitable discrepancies in how donors are treated under the federal tax code. Under this type of carveout, a Louisiana taxpayer donating $100 to support private school education and receiving $95 back in state tax credits would continue to receive a full federal charitable deduction. A New York taxpayer donating $100 to support public school education and receiving just $85 back in state tax credits, by contrast, would see their federal charitable deduction drastically reduced, to just $15. Absent this regulation, the Louisiana tax credit is actually the more lucrative tax shelter because it offers a larger reimbursement (95 rather than 85 percent). As in New York, the Louisiana credit is uncapped both at the taxpayer level and statewide. Given a choice, a taxpayer interested only in tax avoidance would rather have access to Louisiana’s credit than New York’s. But a carveout would leave Louisiana’s lucrative shelter intact while closing down its less lucrative counterpart in New York. A carveout would be particularly complicated in states such as Pennsylvania, where preexisting tax credit programs offer the donor a choice of donating to either an independent nonprofit organization or to various community foundations setup to support public school districts, among other causes. A similar situation exists in Georgia, where a tax credit for donations to rural hospitals can be claimed on donations to public as well as private hospitals. Viewed through the eyes of prospective donors, there is no fundamental difference between the many organizations eligible to benefit from Georgia or Pennsylvania’s tax credit programs. But a carveout would require vastly different federal tax treatment of donors to those various organizations, including different treatment among donors participating in the same overarching state tax credit programs. Carving out state or local charitable tax credit programs from this regulation would create an opening for creative state and local lawmakers to find ways to redesign their policies to fit within the boundaries of the carveout. For example, any of the fifteen states offering spending-side vouchers for private school attendance could repackage those programs into tax-side credit programs. That is, rather than directly appropriating state funds to private school vouchers, these states could entice high-income taxpayers to fund those vouchers with donations made in exchange for very large tax credits. If the size of the new credit programs were the same as the original voucher programs, this repackaging would matter little to state governments, private schools, or families receiving vouchers. But for prospective donors, funding the programs through “charitable donations” rather than traditional appropriations would open new avenues for SALT cap avoidance. Even more worrisome is that a carveout would incentivize democratically elected state and local governments to relinquish control over many of their current functions, even as they still fund those functions via their tax credit programs. For example, if tax-credit-reimbursed donations to private charities remain fully deductible then states led by lawmakers who are ideologically inclined to privatize or “charitize” large swaths of their public education systems, human services, etc. would be best positioned to grant their taxpayers an opportunity to circumvent the SALT cap. State credit programs are already available for donations to nonprofit organizations that provide foster care, substance abuse counseling, or care for the disabled. Expanding these types of credits, perhaps funded by enacting cuts to direct spending on social services, would offer another possible route for SALT cap avoidance. A regulation only impacting donations to public entities may curb some of the boldest SALT cap workarounds. But it would not stop states from seeking out ways to afford their residents a tool for dodging the SALT deduction cap. Limiting the scope of the regulation only to programs established after a certain date would cause taxpayers who are making virtually identical donations under virtually identical programs to receive vastly different federal tax treatment based solely on the state in which they reside. For instance, a carveout of this type would require offering a full charitable deduction to Alabama residents making use of the state’s private school voucher tax credit, but denying that same deduction to Kentuckians in the event that their state chooses to enact a substantially similar program, as lawmakers have contemplated in recent years. Such an approach would also require identifying the circumstances under which a preexisting credit would lose its exemption from the regulations. For instance, following the passage of the TCJA, Georgia lawmakers increased the statewide cap on their 100 percent tax credit for private school voucher donors by 72 percent—from $58 million to $100 million. Pennsylvania lawmakers later increased the cap on one of their credits by 19 percent—from $135 million to $160 million. New Hampshire lawmakers expanded the donor pool of their private school credit by broadening its reach into the state’s limited income tax on interest and dividends. Other states, such as Arizona and Florida, undertook dramatic expansions in their private school voucher donation credit programs this year through automatic formulas written into their laws. Even if there was a good reason to exempt preexisting programs from the proposed regulation—which there is not—the post-TCJA changes outlined above should be sufficient for many of the largest programs to lose that exemption anyway. It cannot be said of donors who made deductible charitable contributions under the pre-existing provisions that they did so primarily to “avoid the SALT cap” or that these programs were designed as a SALT cap workaround when they were all offered prior to the enactment of the SALT cap in the TCJA. In the context of state tax credits for private K-12 school voucher donors, this argument rings hollow for a few reasons. First, there are unquestionably many donors who have contributed under preexisting programs this year primarily to avoid the SALT cap. The most dramatic evidence of this comes from Arizona, where interest in the state’s Low-Income Corporate Income Tax Credit (available to both pass-through businesses and C-corporations) surged this year. In 2017, the year before the TCJA and the $10,000 SALT deduction cap went into effect, it took private school groups nearly six months to convince businesses to donate $74 million—the maximum amount eligible for tax credits that year. In 2018, however, the program’s cap grew by 20 percent, to $89 million, and private school groups modified their sales pitch into an aggressive advertising campaign touting the credit’s ability to facilitate SALT cap avoidance. The result was that $89 million in credits were claimed in just two minutes, with hundreds of businesses being turned away due to a lack of available credits. Had those additional businesses been allowed to claim the full credits they requested, the result would have been $137.2 million in credit claims in 2018—and untold millions more from businesses that did not apply because the application period closed so quickly. A similar development unfolded in Alabama this year. That state’s $30 million allotment of private school donation credits was claimed within two months, six times faster than the year before. 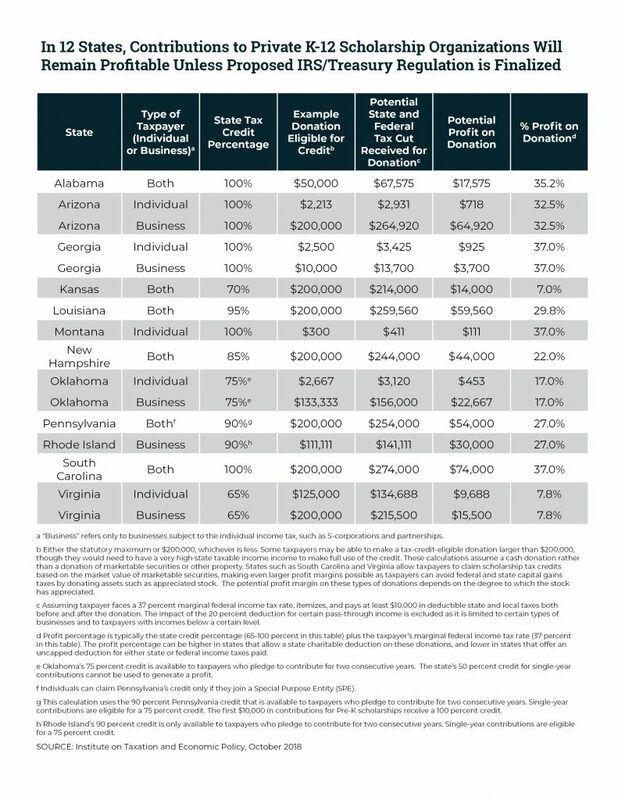 ITEP has extensively documented tax shelter advertisements published in Alabama and elsewhere during the first half of 2018 that emphasized how to reap state and federal tax rewards larger than the amounts donated, and that referred to participation in state voucher tax credit programs as a way to “preserve” or “avoid losing” the SALT deduction despite the $10,000 cap contained in the TCJA. Both Arizona and Alabama offer 100 percent tax credits for donations to support private school vouchers, meaning that any taxpayer with even a modicum of interest in this cause should already have been participating in 2017 because participation was costless for them (the entire donation is reimbursed via a state tax credit). The surge of interest seen in 2018 is clear evidence that many of this year’s claimants were opportunists seeking to dodge the new SALT deduction cap and effectively turn a profit for themselves. The QEE tax credit’s popularity can be attributed to the marketing of private schools in Georgia. Private schools, as beneficiaries of the credit, have an obvious incentive to promote its use and generally have a loyal base of high income parents who benefitted from the AMT tax savings. In evaluating the need to include private school voucher credits within the scope of this regulation, it is important to keep in mind that the use of these credits as federal tax shelters is not a new phenomenon. In fact, given their longevity there is no doubt that these private school voucher credits have facilitated far more avoidance of SALT deduction limitations (under both the AMT and the new $10,000 cap) than the newest workaround credits in New York and elsewhere. Reform of the federal tax treatment of these donations is overdue, and this current regulatory project is the ideal moment to implement that reform. Third and finally, there is abundant evidence that in at least some states with voucher tax credits, these tax shelters were known to state lawmakers and yet no action was taken to remedy the problem. States that refused to close the widely-reported tax shelters facilitated by their private school credits should not be allowed to plead ignorance when seeking a carveout for their programs. There is good reason to doubt that the authors of these programs were unaware that they could be exploited as tax shelters at the time they were created. As early as 2001, the Florida legislature saw it fit to include language precluding any tax shelter behavior by requiring taxpayers to reduce their (100 percent) state tax credit by the amount of federal tax benefit that they received. The vast majority of state private school tax credits were enacted after the Florida law, and yet until Illinois in 2017 none saw it fit to include a similar protection in their own statute. As the credits proliferated, accountants, lawyers, financial advisors, and private schools in states lacking a Florida-style safeguard predictably sprang into action and began marketing the programs as tools for avoiding SALT deduction limitations—first under the AMT and later under the $10,000 cap. ITEP and AASA uncovered examples of this type of marketing dating back to 2013, though it almost certainly extends much farther back than this. South Carolina provides one of the clearer examples of state lawmakers giving their implicit blessing to the tax shelter embedded within their private school tax credit. Within months of their credit being enacted into law in 2013, the South Carolina Department of Revenue briefed a group of state senators on the fact that donors would receive three tax cuts in return for making donations: a 100 percent state credit, a federal charitable deduction, and a state charitable deduction. The revelation sparked media stories in 2013, 2014, 2016, and 2018 referencing the “profit” potential of the state’s credit. And yet while lawmakers eventually opted to deny the state-level charitable deduction to taxpayers receiving the credit, they took no steps to address the clear federal tax shelter facilitated by their policy choices. South Carolina lawmakers are not alone in knowingly offering a tax shelter to private school donors. In 2017 this issue began to receive substantial attention from the national media as stories appeared in the New York Times, Associated Press, National Public Radio (NPR), and elsewhere. In addition to the reporting out of South Carolina, similar coverage began to appear in major publications in Georgia, Montana, New Hampshire, and Pennsylvania. And yet, no state offering the tax shelter responded to this coverage by taking action to remedy the problem. In fact, New Hampshire lawmakers voted to expand the availability of their credit even after multiple media reports and remarks by Rep. Susan Almy on the floor of the New Hampshire House of Representatives made clear that their action would offer new tax shelter opportunities to wealthy investors in the state. Similarly, Georgia and Pennsylvania lawmakers approved dramatic tax credit expansions in 2018, without any safeguards, despite coverage of the tax shelter in some of those states’ largest news outlets. The proposal of this regulation has resulted in even more attention being paid to this shelter. Lawmakers, tax professionals, private schools, and the general public have never been more aware of the tax shelter opportunities embedded in private school credits. Given this reality, any effort to insert a carveout for private school donors and other private charities at this late stage of the regulatory process would be sure to generate a flood of interest in these programs not by people who support the mission of these programs, but by opportunistic tax-avoiders seeking to exploit the shelter. Given state lawmakers’ track record on this issue, it is unrealistic to expect them to remedy this problem on their own. Ending the federal tax avoidance facilitated by these credits will require action by the IRS. The proposed regulation does not offer sufficient clarity on the question of how donations of appreciated property will be treated when those donations entitle the donor to a significant state or local tax credit. ITEP has not undertaken a comprehensive review of which state charitable donation credits can be claimed based on the market value of assets donated, but at least some states clearly offer credits for these types of donations. For example, Iowa, Kansas, South Carolina, and Virginia offer tax credits ranging from 65 to 100 percent of the value of marketable securities or other assets donated to fund private K-12 school vouchers. Under this proposed regulation, a donation in exchange for a 100 percent tax credit should be treated as equivalent to a sale at market value (“other disposition of property” under section 1001) and the taxpayer should either owe tax on the portion of that sale that represents a gain, or recognize a loss if appropriate. When the donation is made in exchange for a tax credit worth less than 100 percent of the amount donated, the transaction should be treated as part gift and part sale. To fully close the tax shelter facilitated by state and local charitable donation credits, it is essential that donations of appreciated property resulting in credits above the de minimis exception be treated as taxable events. Failing to do so would preserve a situation where taxpayers with appreciated property they wish to offload will find it more beneficial to donate that property in exchange for a large tax credit, rather than sell it at its fair market value. This outcome would be distortionary as it would spur taxpayers who may have little genuine interest in the programs benefiting from state and local tax credits to participate in those programs solely for reasons of tax avoidance. The following table uses an example from South Carolina to illustrate that in states allowing donations of appreciated property, merely reducing or denying the charitable deduction will not be enough to close the tax shelter facilitated by state and local charitable tax credits. Even without a federal charitable deduction, for instance, a South Carolina investor with stock that is worth $125,000 and that has a $50,000 basis would find that donating the stock in exchange for the state’s 100 percent “Exceptional SC” tax credit would save them $23,100 in federal and state taxes relative to selling that same stock. In other words, accountants in South Carolina are all but guaranteed to advise their clients that “donating” appreciated property under the state’s tax credit program is in their financial best interest—an outcome that flies in the face of any commonsense understanding of charitable giving. To restore logic to the tax code and prevent the use of state and local tax credits as tools for avoiding federal taxes on capital gains income, the final regulation should clarify that donations of property benefiting from significant state or local tax credits will be treated partly or wholly as “other disposition of property” under section 1001. As the IRS is aware, there are at least two hurdles to labeling a contribution to a charitable organization as an “ordinary and necessary” business expense, as opposed to labeling it as a more familiar charitable gift. First, the contribution must be “made with a reasonable expectation of financial return commensurate with the amount of the transfer.” For example, a travel agent was once allowed to deduct her contributions to charities as business expenses partly because she “had reason to believe that some of her charitable clients would have ceased doing business with her if she had not continued to make such payments.” In the current context, one of the most significant lingering questions is whether the IRS will consider state tax credits a “financial return.” If credits do count, then it will be very easy for businesses to show that a donation that earned them a hefty state tax credit (sometimes worth up to 100 percent of the amount donated) generated a financial return. The IRS should make clear whether it intends to consider state and local tax credits a “financial return” in this context. Even if the credits do not count, however, there have been numerous instances in which businesses have convinced the IRS or the courts that their contributions to charitable organizations were expected to generate a financial return. Opinions differ about how easy it will be for businesses to prove that their contributions to private school voucher funds, and other tax-credit-eligible programs, are legitimate business expenses. But the IRS and Treasury statements provide compelling reason to believe that these deductions, and the tax shelter they facilitate, are within reach for many businesses. This regulatory project has involved a great deal of thought into how best to administer the charitable deduction when taxpayers see their contributions reimbursed with state tax credits. It is vital that the IRS undertake a similar effort in the context of the business expense deduction, as failing to do so would create an opening for some businesses to sidestep the new charitable deduction regulation by labeling their contributions as business expenses instead. Under no circumstance should a business be allowed to reap tax rewards (e.g., state tax credits and federal business expense deductions) that exceed the size of their transfers to charitable organizations. The best approach, then, would be for Treasury and the IRS to promulgate final quid pro quo regulations stating that the amount of an otherwise deductible contribution is always (apart from a de minimis rule) reduced by the value of benefits received by the donor from any source—whether the source is the donee itself, or any third party. Thus, instead of being an exception to the general rule for third party benefits, the reduction in the amount of a contribution to a private charity by the amount of the state tax credit generated by the contribution would be simply an application of the general rule. ITEP agrees with this recommendation. As explained by Mr. Zelenak, there is no mandate either in statute or from the courts that third party benefits must be ignored by the IRS when determining what constitutes a quid pro quo. Because of this, it is much more sensible for the IRS to begin considering third party benefits in general rather than pursuing an inconsistent treatment where they are considered a quid pro quo when they take some forms (i.e. state and local tax credits) but not others. ITEP supports the proposed regulation as it represents a significant improvement to the federal charitable deduction. The regulation could be improved, however, by refining its treatment of third party benefits. And additional improvements are also needed to prevent taxpayers from pairing state or local tax credits with federal benefits such as capital gains tax avoidance or business expense deductions in ways that lead to the transactions in question being profitable to the taxpayer based on the tax savings alone. Most importantly, the IRS and Treasury Department should categorically reject appeals to weaken the regulation by carving out preexisting tax credit programs or tax credit programs benefiting non-public entities. Many of these preexisting tax credits—particularly for private school voucher donors—were claimed for reasons of tax avoidance under the AMT and were exploited as SALT cap workarounds during the first half of 2018. The use of these credits as tax shelters was known to many state lawmakers, and yet almost no action has been taken at the state level to remedy this shelter. A more realistic federal tax treatment of these tax-credit-reimbursed transfers is overdue, and this regulatory project represents the ideal moment to implement such a treatment. It is vital that any new regulation on the topic of state and local charitable tax credits include not just the newest iterations of these credits, but also preexisting credits that have facilitated federal tax avoidance for many years. A catalogue of some of ITEP’s research on this subject is available at: https://itep.org/itep-resources-on-the-upcoming-salt-workaround-regulations/. Davis, Carl. “Twelve States Offer Profitable Tax Shelter to Private School Voucher Donors; IRS Proposal Could Fix This.” Institute on Taxation and Economic Policy. Oct. 2, 2018. Available at: https://itep.org/twelve-states-offer-profitable-tax-shelter-to-private-school-voucher-donors-irs-proposal-could-fix-this/. Some commenters are suggesting that the regulation only apply to donations made to entities described in IRC section 170(c)(1). For example, see: Cathey, Thomas J. and Philip Scott. “Re: Notice of Proposed Rulemaking, Docket ID IRS-2018-0025, Contributions in Exchange for State or Local Tax Credits (REG-112176-18).” ASCI and ASCI Children’s Fund. Tracking Number: 1k2-95t1-l7ce. Oct. 5, 2018. Available at: https://www.regulations.gov/document?D=IRS-2018-0025-3199. Lists of eligible donees are available from the Pennsylvania Department of Community and Economic Development at: https://dced.pa.gov/programs/educational-improvement-tax-credit-program-eitc/. Lists of eligible donees are available from the Georgia Department of Community Health at: https://dch.georgia.gov/rural-hospital-tax-credit. Those fifteen states are identified here: https://www.edchoice.org/school-choice/school-choice-in-america/#. Bankman, Joseph, David Gamage, Jacob Goldin, Daniel Hemel, Darien Shanske, Kirk J. Stark, Dennis J. Ventry, and Manoj Viswanathan. “State Response to Federal Tax Reform.” State Tax Notes. May 7, 2018. Available at: https://ssrn.com/abstract=3098291. A few examples of such programs include tax credits for contributions to the following programs: Arizona foster care, Colorado child care, Idaho youth facilities and substance abuse centers, Missouri child services and maternity homes, and Utah disability services. 112176-18).” TIAA Endowment and Philanthropic Services. Tracking Number: 1k2-95r3-cy87. Sep. 25, 2018. Available at: https://www.regulations.gov/document?D=IRS-2018-0025-2808. Davis, Carl. “The Other SALT Cap Workaround: Accountants Steer Clients Toward Private K-12 Voucher Tax Credits.” Institute on Taxation and Economic Policy. Jun. 27, 2018. Available at: https://itep.org/the-other-salt-cap-workaround/. Information provided via email by Karen Jacobs of Arizona Department of Revenue on Aug. 29, 2018. Johnson, Krista. “Alabama Accountability Act: How taxpayers benefit from donating.” Montgomery Advertiser. Aug. 3, 2018. Available at: https://www.montgomeryadvertiser.com/story/news/education/2018/08/03/alabama-accountability-act-how-taxpayers-benefit-donating/872790002/. Ely, Bruce, Page Stalcup, Lesley Searcy, and Bri Jackson. “The New Federal Tax Law and Tax Credit Scholarship Donation Benefits for Alabama Taxpayers.” Presentation for the Alabama Opportunity Scholarship Fund. Feb. 16, 2018. Available at: https://alabamascholarshipfund.org/_pdfs/Tax_Credit_Scholarship_Donation_Webinar_02_16_2018.pdf. Crain, Trisha Powell. “$30 million in AAA tax credits already claimed for 2018.” AL.com. Apr. 27, 2018. Available at: https://www.al.com/news/index.ssf/2018/04/30_million_in_aaa_tax_credits.html. The credits were even financially profitable for AMT payers, as discussed below. The tax shelter described in these comments is operative whenever taxpayers find themselves in situations where charitable deductions are more valuable than SALT deductions. These situations are common among high-income taxpayers in 2018 because of the new $10,000 cap on SALT deductions. Prior to 2018, however, these situations were largely confined to the AMT. The AMT is designed to ensure that taxpayers receiving generous tax breaks pay at least some minimum level of federal income tax. This is accomplished by denying certain tax breaks under AMT rules, including the deduction for state and local tax payments. Charitable donations, however, are still tax deductible under the AMT. Making a donation and receiving a voucher tax credit, rather than not donating and simply paying state income tax instead, was therefore of significant benefit to taxpayers subject to the federal AMT. This group often found that the combined state and federal tax cuts associated with participating in these programs exceeded the size of their donations. Pudelski, Sasha and Carl Davis. “Public Loss Private Gain: How School Voucher Tax Shelters Undermine Public Education.” AASA and ITEP. May 2017. Available at: https://itep.org/public-loss-private-gain-how-school-voucher-tax-shelters-undermine-public-education/. Lina, Jason. “Georgia Rural Hospital Tax Credit and Qualified Education Expense Credit Under the New Tax Law.” Resource Planning Group. Available at: http://rpgplanner.com/rural-hospital-credit-and-qualified-education-expense-tax-credit/. Laws of Florida. Ch. 2001-225. Available at: http://laws.flrules.org/2001/225. Self, Jamie. “More than one tax benefit for S.C.’s school-choice credit.” The State. Sep. 1, 2013. Slade, David. “’Donation’ can make you a profit.” The Post and Courier. Jul. 12, 2018. Available at: https://www.postandcourier.com/business/donation-can-make-you-a-profit/article_412688ac-87ef-5077-af48-a37ce59fb932.html. Slade, David. “Exceptional needs credit, part two.” The Post and Courier. Sep. 10, 2016. Available at: https://www.postandcourier.com/business/exceptional-needs-credit-part-two/article_fd397c24-5518-5518-9dbe-73d734ab7ff1.html. Pan, Deanna. “An abuse of charitable giving? Federal tax rewrite opens golden door for South Carolina’s richest.” The Post and Courier. Jan. 14, 2018. Available at: https://www.postandcourier.com/news/an-abuse-of-charitable-giving-federal-tax-rewrite-opens-golden/article_fd1f3ad6-eff8-11e7-8e8a-5fc58b61d1c0.html. Green, Erica L. “In Some States, Donating to Private Schools Can Earn You a Profit.” New York Times. May 17, 2017. Available at: https://www.nytimes.com/2017/05/17/us/politics/in-some-states-donating-to-private-schools-can-earn-you-a-profit.html. Ho, Sally. “School voucher programs raise questions about transparency and accountability.” Aug. 11, 2017. Available at: https://www.cbsnews.com/news/school-voucher-programs-raise-questions-about-transparency-and-accountability/. Kamenetz, Anya. “’Tax Credit Scholarships,’ Praised By Trump, Turn Profits For Some Donors.” Mar. 7, 2017. National Public Radio. Available at: https://www.npr.org/sections/ed/2017/03/07/518352548/trump-s-favorite-school-choice-program-allows-wealthy-donors-to-turn-a-profit. Tagami, Ty. “School superintendents say Georgia’s tax credit program is profitable for the rich.” Atlanta Journal-Constitution. May 17, 2017. Available at: https://www.ajc.com/news/state–regional-education/school-superintendents-say-georgia-tax-credit-program-profitable-for-the-rich/XMdbL2HIWptRwUwodGPmxJ/. Hoffman, Matt. “Montanans not lining up for school choice tax credit, even though some could make a buck.” Billings Gazette. Dec. 4, 2017. Available at: https://billingsgazette.com/news/state-and-regional/montana/montanans-not-lining-up-for-school-choice-tax-credit-even/article_6d100a76-5f27-55d2-a453-a22c94608c55.html. Duffort, Lola. “Researcher: N.H. school choice bill could create ‘tax shelter’ for rich.” Concord Monitor. Feb. 18, 2018. Available at: https://www.concordmonitor.com/Some-warn-bill-could-make-donating-to-ETC-program-profitable-15533972. Moon, Jason. “With N.H. Lawmakers Focused Elsewhere, Another School Choice Bill Flies Under the Radar.” New Hampshire Public Radio. Mar. 5, 2018. Available at: http://www.nhpr.org/post/nh-lawmakers-focused-elsewhere-another-school-choice-bill-flies-under-radar#stream/0. Moon, Jason. “N.H. Senate Passes Bill to Expand Education Tax Credit Program.” New Hampshire Public Radio. May 4, 2018. Available at: www.nhpr.org/post/nh-senate-passes-bill-expand-education-tax-credit-program#stream/0. Lord, Rich. “Tax changes could help parochial schools.” Pittsburgh Post-Gazette. Dec. 22, 2017. Available at: http://www.post-gazette.com/business/money/2017/12/22/Federal-tax-changes-help-parochial-private-schools-Education-Improvement-Tax-Credit/stories/201712220149. Wolfman-Arent, Avi. “New federal tax ‘loophole’ could stoke interest in private school donations in Pa.” WHYY. Jan. 1, 2018. Available at: https://whyy.org/articles/new-federal-tax-loophole-stoke-interest-private-school-donations-pa/. Illinois enacted a new credit in 2017 that included a safeguard against the shelter. Remarks by State Rep. Susan Almy on the floor of the New Hampshire House of Representatives pertaining to House Bill 1686-FN. House Record. Mar. 15, 2018. Available at: http://www.gencourt.state.nh.us/house/caljourns/journals/2018/HJ_8.pdf#page=54. Iowa Stat. §422.11S(1). K.S.A. §72-99a02(a). S.C. State Budget Proviso 109.15(H)(1). Code of Va. §58.1-439.26(A). Marotta, David John and Megan Russell. “Education Improvement Scholarship Tax Credit.” Marotta Wealth Management. Aug. 16, 2015. Available at: https://www.marottaonmoney.com/education-improvement-scholarship-tax-credits/. 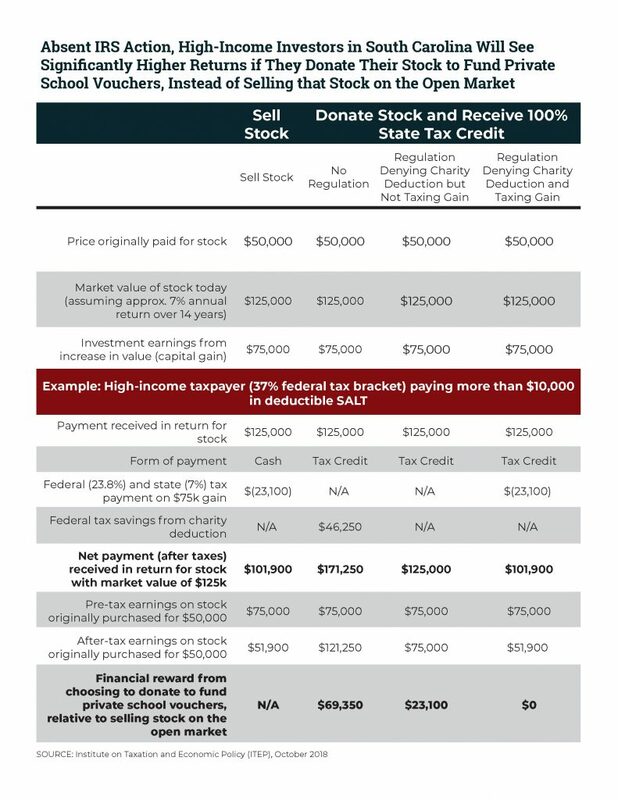 While the math contained in the specific example is now outdated because of passage of the TCJA and the potential impact of this proposed regulation, it remains true that some Virginia taxpayers will find donating to be more financially advantageous than selling unless the IRS requires those donors to recognize a gain. Internal Revenue Service. “Clarification for business taxpayers: Payments under state or local tax credit programs may be deductible as business expenses.” IR-2018-178. Sep. 5, 2018. Available at: https://www.irs.gov/newsroom/clarification-for-business-taxpayers-payments-under-state-or-local-tax-credit-programs-may-be-deductible-as-business-expenses. U.S. Department of the Treasury. “Treasury Secretary Mnuchin Statement on Clarification for Business Taxpayers: Contributions Under State and Local Tax Credit Programs Generally Deductible as Business Expenses.” Sep. 5, 2018. Available at: https://home.treasury.gov/news/press-releases/sm472. Rubin, Richard. “IRS Clarification Eases Deduction Limits for Some Business Owners.” Wall Street Journal. Sep. 5, 2018. Available at: https://www.wsj.com/articles/irs-clarification-eases-deduction-limits-for-some-business-owners-1536177440. Gaetano, Chris. “IRS Offers SALT Cap Workaround for Business Taxpayers.” The Trusted Professional: The Newspaper of the New York State Society of Certified Public Accountants. Sep. 6, 2018. Available at: https://www.nysscpa.org/news/publications/the-trusted-professional/article/irs-offers-salt-cap-workaround-for-business-taxpayers-090618. Chamseddine, Jad. “IRS SALT Clarification May Need Further Clarification.” Tax Notes. Sep. 11, 2018. Available at: https://www.taxnotes.com/tax-reform/irs-salt-clarification-may-need-further-clarification. Michel, Adam N., Lindsey M. Burke, and Jonathan Butcher. “Comment on the Impact of Regulations for Contributions in Exchange for State or Local Tax Credits on State-Based Tax Credit Scholarship Programs.” Tracking Number: 1k2-95ik-zg73. Sep. 19, 2018. Available at: https://www.regulations.gov/document?D=IRS-2018-0025-1620. Marquis v. Commissioner of Internal Revenue, 49 T.C. 695 (1968). Professor Andy Grewal of the University of Iowa, for instance, has noted that “Arguably, the state tax credit that arises from a transfer to a school choice program itself provides the financial return that establishes a Section 162 deduction.” Grewal, Andy. “When IRS Guidance Backfires.” Notice & Comment. Sep. 7, 2018. Available at: http://yalejreg.com/nc/when-irs-guidance-backfires/. “New Charitable Deduction Rules Could Impact Popular State Tax Credits.” Frazier & Deeter. Available at: https://www.frazierdeeter.com/articles/new-charitable-deduction-rules-could-impact-popular-state-tax-credits/. Federal Register. Vol. 83, No. 166, at 43565. Zelenak, Lawrence. “Comments on Proposed Regulations, ‘Contributions in Exchange for State or Local Tax Credits’ (REG-112176-18).” Tracking Number: 1k2-959t-nj4z. Sep. 6, 2018. Available at: https://www.regulations.gov/document?D=IRS-2018-0025-0120.